I like to do a contrast neck facing, not as a fabric efficiency measure, as there aren't enough scraps left over to cut one out. The first time I had to buy extra fabric it had sold out, so I went for a contrast. And realised that I liked it so continue the theme. I probably should have bought the robots contrast on Saturday but foolishly I didn't. So after work today I ventured to the store I now call Lincrap (I remember the days when it had a higher quality fabric stock) only to be disappointed. Their plain colour flannelette's were of such poor quality I don't understand how they sell at any price. I was left with an assorted and small choice of patterns, and none of them had a siren song but I want to sew this quickly, and it's already cut out saying "robots are awesome". 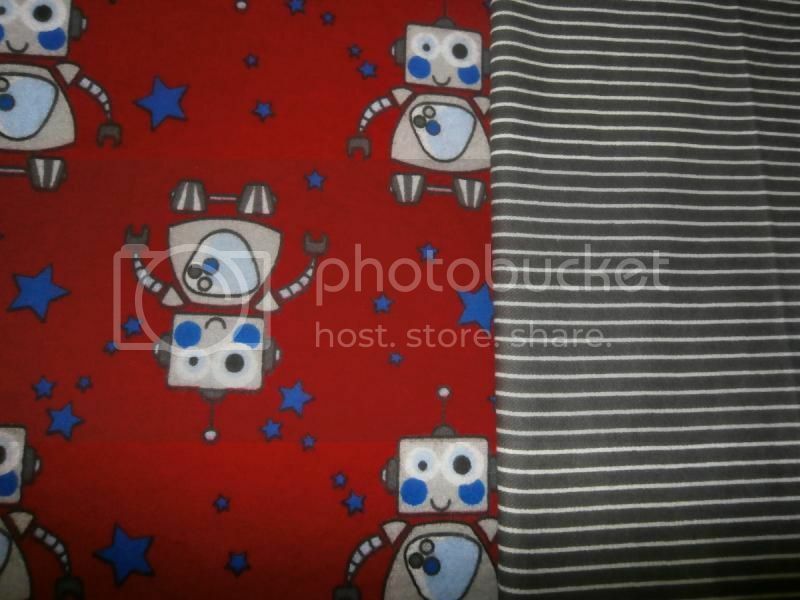 So i went with a grey & white stripe, that will kinda blend into the grey of the robots. I don't want the blue as royal blue isn't so flattering for me, and it wouldn't make me happy even if it was a great contrast for the fabric. It's hanging on my shower rail, already pre-shrunk. Hopefully start stitching on Wednesday night.